Left to Right, Bottom to Top: Gendo, Misato, Asuka, Kaoru, Kensuke, Shinji, Touji, and Rei. Now, I've just gotta make up cutie marks for all of them. EDIT: BTW, I drew nothing, it was made with Pony maker and my imagination! I don't think anyone here knows about Evangelion. Looks like you made it with General Zoi's pony maker. 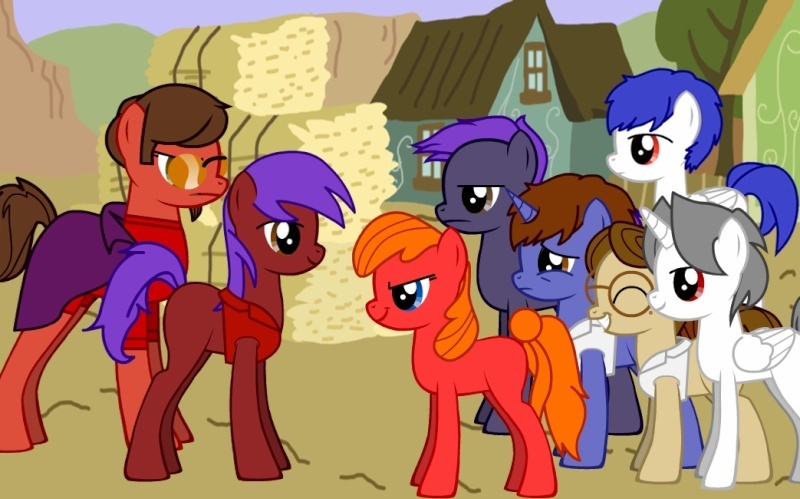 The pony with glasses seems to be eager and studious, so a book could be the cutie mark. The female pony with a red coat seems to flare with fiery passion, so maybe a flame could be her cutie mark. And I see one alicorn, one unicorn, one pegasus, and five earth ponies. Seems to be unbalenced, doesnt it? CharMew wrote: Looks like you made it with General Zoi's pony maker. You had some good ideas. But the "studious" pony is actually Gendo Ikari, who's like the evil (and kind of physco) father of Shinji Ikari (our whiny hero). And yes, I did use General Zoi's Pony Maker. Btw, this is Neon Genesis: Evangelion, the anime I was parodying.